Robbie’s blood counts started slowly coming back up, which is sooner than last time. They are still low, but out of the danger zone, which means we can take him out of isolation. I’m constantly disinfecting our apartment like a hospital! It made me nervous to have children near him this weekend, but it is hard to know in advance what his blood counts will be. If he catches even a minor cold, he could land in the hospital. Since we all love to read, we went to the half price book store tonight. 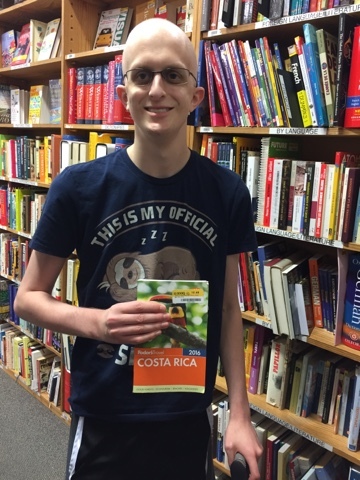 We found travel books for Costa Rica. We’ve had several people contact us since our blog post regarding Robbie’s bucket list. He loves sloths and on his bucket list is a trip to the Sloth Sanctuary in Costa Rica. Ruth put together a site if you are interested in helping.